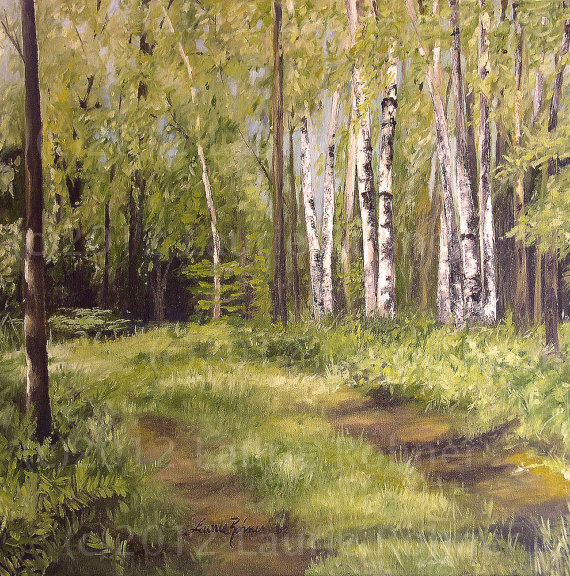 Nature art oil on canvas painting Vermont woodland birch tree landscape original artwork by Laurie Rohner. Scenic Vermont landscape oil painting of Woodland Birch Trees is an original nature art oil on canvas artwork by Laurie Rohner. Moss greens warm browns and white birch bark glisten in the sunlight as you stand looking at a road traveled less. I would take this path each day with the boys my Standard Poodles on our daily hikes through my property, a peacefulness serene place to walk. While you gaze at the birches you can almost smell the sweet scent of the ferns drifting by on the warm breeze. Title: Path to the Birches. Canvas Size: 24 x 24 inches. Signature: Laurie Rohner on front, title date signed certificate enclosed on verso. The painting is on museum wrapped canvas (1.25" deep) with staples hidden on the back with wood. This painting has beautiful color and a great finish from high quality oil paints. The staple-free sides of the canvas are painted. The painting continues around to the sides - framing is not required. I ship everywhere. See my shipping policy for information.